To make sure your growing baby has all the nutrients she needs to develop, here are a few things you should add to your diet until you deliver. Calcium is an essential component of your growing baby's bones and teeth—and if there isn’t enough in your diet, some may be taken from your bones to compensate. The most common sources of calcium are dairy products, including milk, yogurt and cheese (about two extra servings a day will give you enough). Calcium can also be found in spinach, broccoli, dried beans, almonds and canned salmon. If you can’t tolerate dairy products, you should discuss this with your doctor or a nutritionist, as a supplement may be necessary. Iron is part of the red blood cells (in both mother and baby), which transport oxygen throughout the body. It can be found in liver, eggs, red meat and dried beans. Vitamin C aids iron absorption, so drinking orange juice with your meal, for example, will maximize the benefits of iron-rich foods. 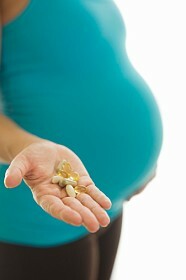 Folic acid is a B vitamin, which is very important in preventing spinal cord defects (such as spina bifida). These problems originate early in pregnancy, so many experts recommend increasing your intake of folic acid even before conception. Foods high in this nutrient include organ meats, dark green vegetables, legumes, oranges, cantaloupes and honeydew melons. The Society of Obstetricians and Gynaecologists of Canada recommends a 0.4 to 1.0 mg daily folic acid supplement from the time you stop taking birth control until about six weeks postpartum. For women at higher risk (e.g. women who have had a previous baby with a spinal cord defect), an increased dosage may be recommended. TIP Heartburn is a common complaint during pregnancy. But an extra hit of calcium can quickly calm an upset stomach, says Beth McMullen, a Pharmacist in Willowdale, Ont. She recommends one or two chewable TUMS tablets, which contain calcium carbonate, as needed to a maximum of four times a day (too much can cause constipation).